GM technology can actually help reduce the amount pesticides. Bt corn and Bt cotton resist the corn borer itself so farmers don’t have to spray (less pesticides). Roundup Ready GM crops provide better weed control that can be provided while the crop is growing. Glyphosate (The Roundup Ready herbicide) is one of the least toxic chemicals available for use, which is why it is so popular among farmers. Safer, more effective chemicals like glyphosate are being developed as we speak. If farmers were not allowed to use GM crops like these, they would have to use more potent chemicals that are active in the soil for a whole growing season and spray multiple times instead of just once, regardless of whether the field was tilled. 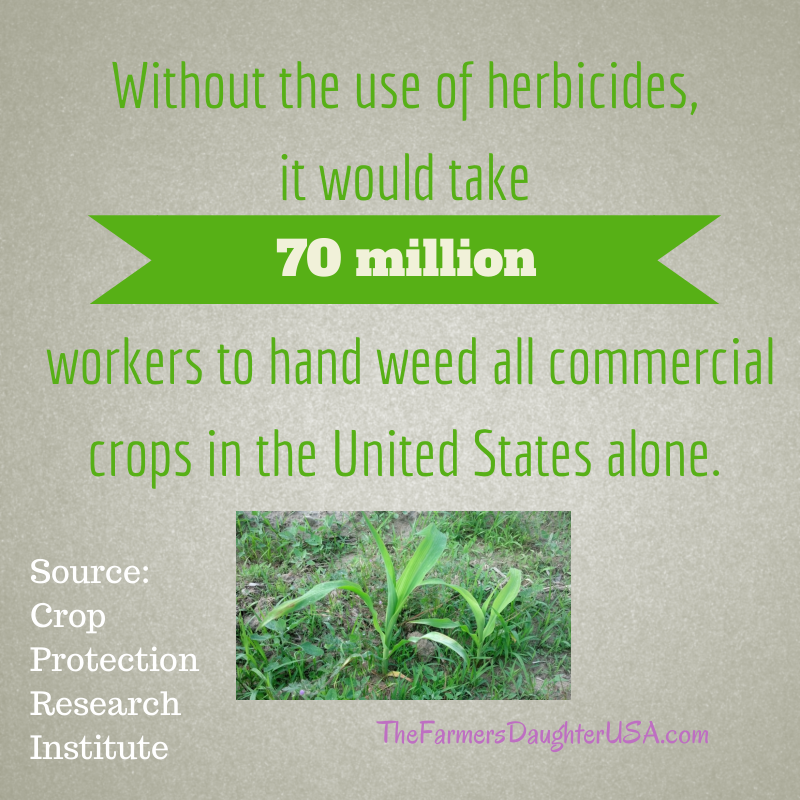 This is why we say that GMOs reduce pesticide usage. Another tool that is being developed to decrease herbicide usage is cover crops. Cover crops are plants that are grown in between growing seasons to help keep the ground covered and hold/provide nutrients in the soil for the future desired crop. There are many potential benefits to cover crops, however, they are still being tested and experimented with. One benefit is that if the ground is growing something throughout the entire year, it can dramatically reduce the opportunity for weeds to grow. This, of course, then reduces the need to spray the weeds. Livestock can also graze cover crops. In this way, the livestock are controlling the weeds/cover crops for the farmer instead of herbicides. Cover crops won’t eliminate the need for herbicides completely but they could potentially lower the use of them quite a bit. Issue #3: Pesticide use in farming is still very high. Large, Agri-Business companies are taking home most of the profit. The whole process caters to larger, more efficient farms and larger, more efficient businesses. It is the same thing in agriculture. There are huge companies in agriculture with a lot of money (John Deere, Case IH, Monsanto, Syngenta, Dow) and it doesn’t always seem fair that they are making most of the profit. But these companies (as well as all of the other large companies I failed to mention) are responsible for most of the research, technology, and development that we’ve seen in the last several decades. GMOs cost millions of dollars and take many years to get approved. There is a lot of research going into safer, more effective pesticides. Who else has millions of dollars to fund this research besides these large agricultural companies? Farming has progressed so much in the last few decades, and we need all the help we can get to continue to progress in the future. Alright, now that we (hopefully) have some common ground in terms of the facts about GMOs, we can talk about the 3 biggest questions I know everyone has: Are GM foods healthy? Are they safe? Are they sustainable? I believe the answer to this question is a resounding yes. As mentioned earlier in the blog, GM products are exactly the same in nutritional value and physical makeup as their non-GMO counterparts. The argument of whether or not GM products are “healthy” can’t really exist in my opinion, because they are literally the same thing (nutrition-wise) as non-GMO products. A nutrition label on an ear of GM corn would be exactly the same as the label on an ear of non-GM corn. Inserting a gene into a plant does not change its appearance or nutritional value. I’ve eaten GM food since I was a kid. Millions of people have eaten GM food since they were kids. In fact, there have been over ONE TRILLION meals containing GMO products consumed over the past 20 years with absolutely no negative health impact found. (Read more here: Trillion Meal Study) There have been zero instances of sickness or death. The debate on the “health” of GM products should be really put to rest, in my opinion. Inserting a gene into a plant does not change the “healthiness” of a food. As of today, all signs point to GMOs being safe to consume. There have been over 2,000 independent studies over the last 20 years on this topic. (Link: 2,000 Studies) As shown in the “Eating GM Crops from the Field” video, I have been around GMOs my entire life and I have never seen any indication of any type of danger associated with their production and consumption. I believe most (if not all) GM crop farmers feel the same way. Are there issues with GMOs? Yes, of course. Many of those were explained in the “Why do farmers use GM Crops?” blog. However, in my opinion, the evidence that currently exists does nothing but support the stance of GM foods being safe. To use a cell phone? (Where are the long term studies? Hopefully you get my point. Nothing in this life is really “safe” and without risk. But we participate in these activities because we feel the benefits truly outweigh the perceived risks! Seriously, if you only worry about living “safe” all the time then you probably aren’t truly living. Life is full of risk. Every type of technology comes with risk. That includes GMOs. GM food has never been shown to be dangerous, but that does not mean the risk isn’t still there. I realize there are alternatives to GMOs that some people believe carry less risk, and that is where the organic food (non-GMO) industry comes into play. (Although there are still risks taken by consuming organic food as well) However, every farmer and consumer should be allowed choices of what to grow and what to eat, and that is why I will now address sustainability. The decision of whether or not to eat GM products is up to you. It is your personal choice. If you choose not to eat them, you can purchase food from the organic aisle in the grocery store. I have no problem with that! Organic producers are some of the hardest working people out there, and I have a lot of respect for them. I just hope you know why you are making that organic food purchase. It cannot be because GMOs are evil, unhealthy, toxic, poisonous, etc. They aren’t. It should only be because you believe there is less risk involved in your purchase. Today, in 2014, we enjoy the safest, most abundant, food supply in the history of the entire world! Never before have we seen the amount of choices of food we have today and the ease of which it’s available. It’s quite amazing to be honest. But yet, millions of people spend their time complaining about their food supply. I don’t get it! I realize that farmers and agribusinesses should be held accountable and that questions should be asked about the safety and quality of food, but at some point thankfulness needs to come into play. Farmers are working harder than you know every day trying to feed you. The least you could do is say thank you. Not complain about what they’re feeding you. (Asking questions and keeping us in check is not complaining) If you do feel we are making bad decisions, then you are absolutely free to grow your own food or buy from another type of farmer (organic). But I hope that you can understand that we are doing the best we can, and we are making the decisions we feel are the right ones, not only for us, but also for the environment and for the consumer. And that includes decisions about GMOs. As human beings, we have to understand that this world is not perfect. Sustainable food production, while theoretically possible, is never going to be perfect either. Are GMOs perfect? No. Is it possible that someday we will find a better alternative? Yes. However, until the day comes when we no longer need the technology, we must continue to improve our methods of production. I believe GMOs to be better for the soil environment, better for farmers, better for poverty-ravished communities, and overall better for producing safe, high-quality, affordable food. That’s why I grow them, eat them myself, and promote the truth about them. I hope you have learned something from reading this blog. Please direct all questions and comments to the main blog: Greg Peterson – Advocate for Truth: GMOs. We will be answering those as part of the blog. Also, feel free to follow us on Facebook to keep in touch! One of the biggest arguments that Christians (and many other people) use against genetically modified organisms is that modifying the genetics of plants is “playing God,” and that changing something God created isn’t right, because it is saying we don’t believe that God’s creation is “good enough.” I do believe this argument would have been true in the beginning of time. As mentioned in the verse above, God saw that what He had created was good, and was by no means in need of modification. It was perfect! Adam and Eve (The first 2 humans) lived in a perfect world, the Garden of Eden. There was no sickness, disease, or lack of comfort. Food was readily available to them and they did not have to toil to feed themselves. Ever since the Fall of Man, the world and everything in it has been riddled with imperfections. It is no longer perfect, and neither are humans. Look around. Both humans and animals encounter all sorts of sickness and injury throughout their lives and can only live so long before they must face death. Sin has run rampant throughout the world ever since that fateful day in the Garden. Our bodies, our minds, our thoughts, our actions, our very souls have all fallen short of the glory of God. (Romans 3:23) We live in an imperfect, broken world. Full of imperfect people, imperfect animals and yes, you guessed it, imperfect plants. Someday a Savior is coming to make all things new. To restore the perfection that once was. This is what we place our hope in! But until that day, we must face the imperfection that plagues this world. How Does Imperfection Affect Farmers? Farmers are called to be the best stewards of the land, animals, and plants that we can be. However, the dilemma of imperfection plays a very significant role in the task that farmers have been assigned with: Feeding the World. You see, imperfect plants are susceptible to drought, floods, disease, insects, weeds, wind, hail, too much sun, too little sun, etc. Farmers have been dealing with these enemies of food production ever since Adam and Eve were banished from the Garden. But, (as mentioned in the main GMO blog) farmers have gradually developed methods of fighting against these things over time. Evidence shows that farmers have been using different techniques (like selective breeding) to genetically alter seeds and crops for thousands of years to make them better yielding and more resistant to things like drought, disease, and insects. We’ve developed irrigation systems to provide water, cultivators to remove weeds, and drainage methods to fight against floods. However, even as late as the mid 1900’s, farmers were barely producing enough food for everyone. And this was when the majority of the population were farmers. Today, farmers make up only 2 percent of the population. 2 percent. How in the world are we still producing enough food with so few people farming? GM crops are the newest agricultural technology that can fight against the imperfections of food production. GM crops are engineered to be increasingly drought-resistant, insect-resistant, and disease-resistant. This kind of resistance leads to increased yields and better food products. In order to feed a growing population, we must embrace this kind of technology. So, should Christians support GMOs? In my opinion, yes. We’ve already talked about how The Fall threw a wrench into God’s original perfection of creation. Therefore, it is not “playing God” to create and use GMOs. It is being a good steward. Christians are called to use their talents and skills to improve what God has given them. Just like in the Parable of the Talents, if farmers are not looking to utilize the gifts and ideas that God has given them, they are not living out their calling. For some perspective, picture in your mind your ancestors from the Great Depression, or the people from the original thirteen colonies of America, or even the people from ancient times. What do you think they would say about today’s food supply? I don’t think their first response would be negative. (Except the Israelites, who famously complained about food that literally fell from the sky) They would be blown away by the quantity, quality, and the availability of the food in our grocery stores. People today (including myself) take so much for granted and complain about things we have. We repeatedly bite the hand that feeds us. A middle class person in America lives a more comfortable life than 99% of people in the history of humanity. Can’t that be enough? When are we going to be satisfied? To be thankful? Farmers are working harder than you know every day trying to feed you. The least you could do is say thank you. Not complain about what they’re feeding you. If you do feel we are making bad decisions, then you are absolutely free to grow your own food! But I hope that you can understand that we are doing the best we can, and making the decisions we feel are the right ones. And that includes decisions about GMOs. As Christians, we have to understand that this world is broken and will remain that way until the second coming of our Lord. Sustainable food production, while possible in theory, is never going to be perfect. Are GMOs perfect? No. Is it possible that someday we will find a better alternative? Yes. However, until the day comes when we no longer need the technology, we must continue to improve our methods of production. I believe GMOs to be better for the soil environment, easier to grow for farmers, higher food production for poverty-ravished communities, and overall better for producing safe, high-quality, affordable food. That’s why I grow them, eat them myself, and promote the truth about them. However, I look forward and wait eagerly for the day in which I no longer need to fight against imperfection! Behold, He is coming to make all things new!